Harsh chemicals, extreme temperatures, long operating hours and hard use wear can quickly take their toll on your equipment. A good preventative maintenance (PM) program will reduce equipment expenses and employee downtime. Unfortunately, many spray equipment buyers don’t think about maintenance until something breaks. We recommend you think about maintenance, not just before something breaks but BEFORE you buy your sprayer. If maintenance is difficult, it will either not get done or take much longer, both of which will cost you money. Before purchasing a power sprayer, make sure you understand which components are likely to need service. Pump, motor, and hose reel are a good place to start. Then think about how each of these components will be accessed for service, once the sprayer is installed in your vehicle. Here are some examples to get you thinking: QSpray uses a raised motor mount so that it is easy to access the pump and motor for service and oil changes. Regular oil changes substantially increase engine life. Raised motor mount - easy access to pump & motor for service, oil changes, etc.Most companies use a flat motor mount because it is cheaper. Unfortunately, you can’t get a wrench under a flat motor mount. This means the entire sprayer must be removed from the vehicle in order to service pump or motor. This adds time & cost. Poor Spray Rig Design. To service pump or motor, the sprayer must be unbolted & removed from the vehicle. Compare our motor mount to how most companies do it: use a flat motor mount to save money in manufacturing. It will cost the user more in the long run in downtime & lost productivity. Pumps on our 12-Volt sprayers are completely accessible for service (photo). Spray pump is easily accessible for service. Not every company does this. The following photo shows the reel swivel is so tight that the reel must be removed to service the swivel. What should be a 5-minute job that can be done in the parking lot becomes hours in a service facility. Qspray rigs feature Cox Hose Reels - easily accessible for maintenance Here's how Qspray does it. 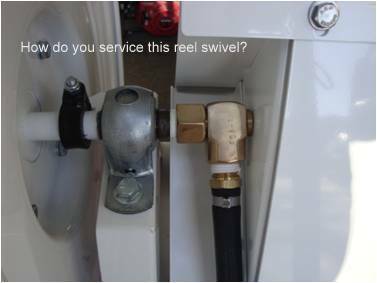 The reel & swivel are completely accessible for maintenance. These are just a couple of examples to get you thinking about what your sprayer will be like to own and operate once it is in your vehicle. Many buyers don't think about these issues until they have a problem - then it is too late. For more information to aid your spray equipment research, read Stop Spraying Money Down the Drain, the industries only guide to spray equipment.